To recover the maximum of solvents emitted in the air and give them back to the production. Usually used to recover expensive organic solvents, or clean the air of robotized painting rooms. Also interesting when some type of solvent need a very high temperature to be destroyed. The process temperature inside the machine will vary, in function of the type of solvent, from -40°C (with just special compressors: world patent ) to -180°C (with the help of liquid nitrogen). In this last case, the liquid nitrogen consumption is remarkably low. The condensate is collected regularly and stored in containers provided for that purpose. A small simple decantation system regularly and fully automatically separates the solvent from the water. Depending on the type of solvents used and the specific request of the customer, a finer distillation (option) allows to separate purer solvents. The distillate is then sent (automatically) in different storage tanks. The cleaning of the parts. The replacement of some solvents used for production. What amount of recovered solvent are we talking about? The manufacturer gives a result greater than 98% recovery of solvents emitted into the air. But even if we rely on 50%, the system is interesting, provided the treatment of solvent obtained is economically viable. The use in closed circuit assure, of course, an optimal recovery as we have NO EMISSION in the atmosphere. Because of the use of a coolant (Freon 507A here), two annual reviews are required. Some of those controls are: pressure tap, check of levels, change of filters (air, water). This section of the revision can be made even by operators briefly trained by us, allowing a real and reassuring independence. in this process there are very few moving parts. the temperatures of the materials remain constant. the CRYOCLEAN is almost entirely made in stainless steel 316L. 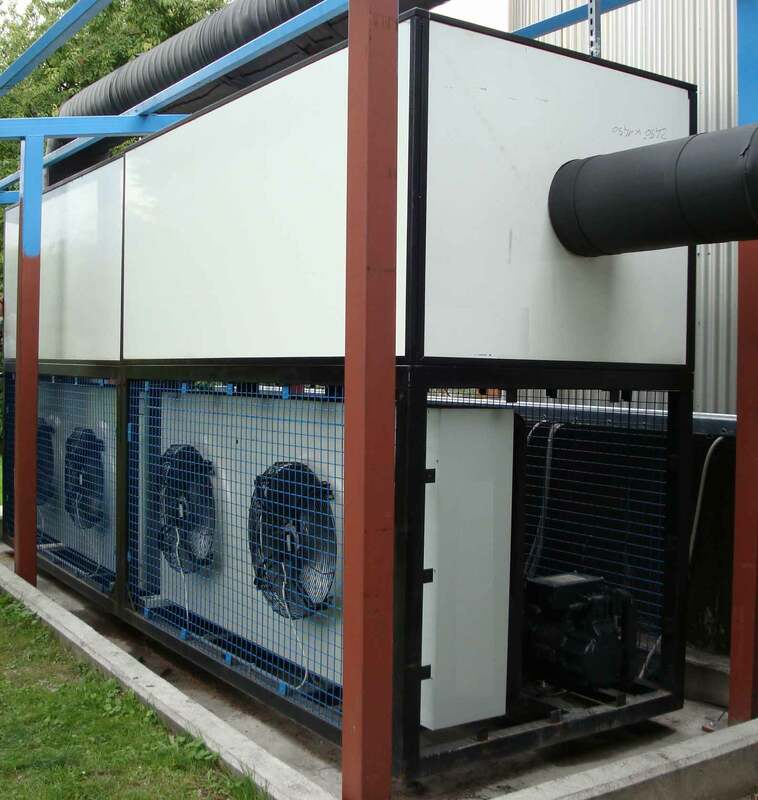 the CRYOCLEAN regularly uses jets of compressed air to clean the interior air circuit. The customer must provide the energy,compressed air and water for the machine. The CRYOCLEAN is mounted on skids, which greatly simplifies its displacement. The other necessary connections are very simple to assemble. The setting, the use and the control of the installation is very simple: everything has been computerized and structured to browse with very little experience. The user patterns and the different pages of the SIEMENS screen give a clear view of the system. The complete plant automation allows a very simple control. the CRYOCLEAN and its accessories can be easily adapted to new work situations. the CRYOCLEAN does not take up much space (equivalent to a sea container). the CRYOCLEAN is mounted on skids to be easily moved. the CRYOCLEAN is not an expensive option among the efficient solutions. the CRYOCLEAN can be used in many different applications, and quickly adapted to treat the new product. All these arguments give this machine a very attractive residual value, which will simplify many discussions with the bankers.